A motorbike rider is in a serious condition in hospital with leg and back injuries following a crash with a car in Midlothian. 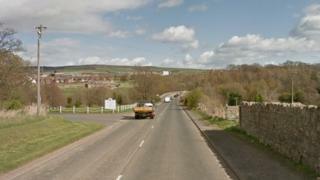 The incident happened at about 12:50 on Wednesday when a black Ducati Diavel Stada was involved in a collision with a Fiat 500L on the B704 at the junction of Carrington Road, Gorebridge. The 48-year-old man was taken to the Edinburgh Royal Infirmary. The road was closed for two hours for police investigations. Insp Richard Latto, of Police Scotland, said: "This is a serious collision, which could result in life-changing injuries for the rider. "We are investigating this incident and are eager to hear from anyone who may have witnessed the collision. "I would urge anyone who was on the B704 around lunchtime on Wednesday 15 March and has information, to get in touch with police immediately."